Brief Synopsis – A man survives a train crash and an art dealer believes that he this is proof that he had extraordinary powers. My Take on it – Who has never wanted to have superpowers? This movie answers the age-old question: How can one be a real superhero in our day and age that still follows the rules of physics. I enjoyed watching The Sixth Sense (1999) very much and when I heard about this movie, I knew I had to see it. I recall seeing it with my friend Robbie and since I had always been a comic book and superhero fan, I was completely glued to my seat watching the story unfold. I thought that the movie was an excellent “origin” story for a new modern day superhero and even as the credits rolled, I hoped that M. Night Shayamalan would one day write a sequel. Alas, that has yet to happen. It surprises me since I read that this is his favorite movie that he ever made and that this movie was only one third of his original movie idea. This is my favorite MNS movie and nothing he has made since has even come close to evoking such an amazing feeling in me. I hadn’t seen this movie in at least 3 years, but when I re-watched it, it brought back memories of how much I enjoyed it all the previous times I’d seen it. 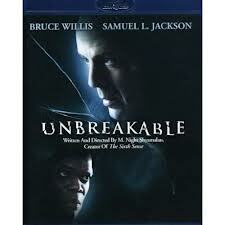 It was great to see a teaming of Samuel L. Jackson and Bruce Willis. Go see it if you haven’t yet. Bottom Line – Great thriller. The best original superhero movie made. Highly recommended!